Haunted History Paypal | Historic Jacksonville, Inc. Here in Jacksonville, we take our history very seriously and we recognize the legacy that the pioneers left for us. We also recognize that some of our pioneers are still with us in the forms of spirits and ghosts. 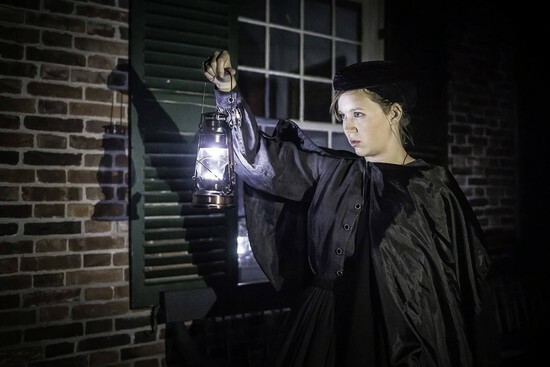 Hear more about these “restless” former residents when Historic Jacksonville offers two different 1-hour “Haunted History” walking tours the 1st and 3rd Friday night of each month from June through September, plus special October tours. Costumed tour guides share both history and tales of pioneers whose spirits still dwell in many of our historic buildings. These tours are not your typical ‘ghost tours’ with special effects. They are history tours about real hauntings resulting from past events. The stories—some scary, some benign—come from multiple sources, from people who have experienced these lingering spirits. They are our attempt to recognize and honor these restless souls. Both tours feature haunted houses. The 7:00 pm Courthouse route shares tales of brothels, epidemics and hangings. The 7:30 pm Britt Hill route includes stories of arson, saloons and Oregon’s first Chinatown. October tours begin at 6pm, 6:15pm, 6:30pm, 6:45pm and 7pm on both Friday, October 12, and Saturday, October 13. Friday night tours feature the Britt Hill route; Saturday night tours follow the Courthouse route. Tour group size is limited! Cost is $5 per person and reservations are strongly suggested. Contact 541-245-3650 or info@historicjacksonville.org. “Walk ups” will be accommodated based on space available. Private tours can also be scheduled for a minimum of 10 people at a cost of $10 per person. Date and time must be mutually agreed upon. 0123456789101112131415161718192021222324252627282930313233343536373839404142434445464748495051525354555657585960616263646566676869707172737475 Pioneer History in Story and Song 3:00pm Sunday, March 10, 2019 5.00 USD " "
Your eTicket will be emailed after payment to your PayPal email address. If you do not receive it, please contact us at ... phone ... email. 0123456789101112 The Secrets of the Beekman Bank Saturday March 5, 2019 7:00pm 5.00 USD ""
0123456789101112 The Secrets of the Beekman Bank Saturday March 5, 2019 8:00pm 5.00 USD ""
You may change quantity on cart screen. THIS IS NO customize bask ADD TO CART PP Button with days and time divided up with drop-down menus. TOO COMPLICATED???? Maybe not.